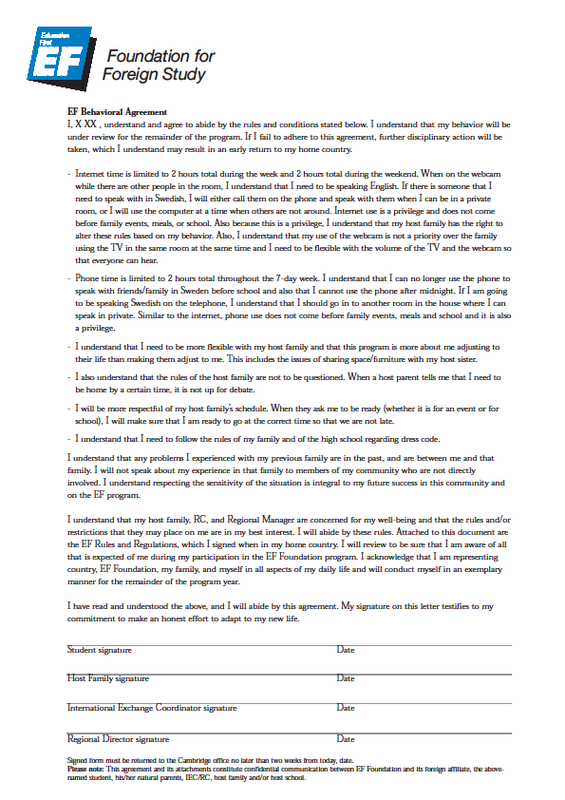 I recently received reports that you continue to have difficulties adjusting to your host family, their rules and expectations and those of the AYUSA program. There are only two and a half months left of your program and these problems should have been overcome at this time. The purpose of this letter is to inform you that you are officially on probation with AYUSA and to clarify with you what we expect of you as an AYUSA student. Failure to make an effort to abide by host family and AYUSA rules could result in dismissal with the AYUSA program. Do not show your host family respect by following their rules. Are not communicating with your community representative to discuss the problems you are having when they occur. Complain about difficulties such as liking the food in America but you have not tried any of the suggestions your community representative and host family have made. Have not made a real attempt at being a family member despite the differences in your interests. Are not completing homework in a timely or disciplined way. Expect the host family to pay for your personal expenses. As an AYUSA student it is expected that you will treat your host family and their home with respect, and follow all AYUSA and Host Family rules. I realize that adjusting to new situations can be challenging. However, you were selected for this program because we believe that you have the maturity and capability to deal with the demands of a year in the United States . Re-read the Student Handbook you were given in orientation and report back to your Community Representative what you have read. Follow all rules without debate. Communicate with your Community Representative once a week for the remainder of the program. Discuss a day and time you will call or meet with Terry each week. Accept suggestions about food. You are welcome to prepare your own meals or snacks if there are meals you do not like. Ask to go to the supermarket with your host parents when they shop so you can purchase extra items you prefer. Buy a rice cooker to have rice with meals if this is important to you. Cook meals for your host family once in a while that are typical from your country so you can share your culture with them. Complete homework when you first get home from school, and then play. If you have homework over the weekend, complete it on Fridays or Saturdays. Host Families are not responsible for extra items such as dining out, movies, school expenses or personal items. AYUSA host families voluntarily host students and their generosity of having you live with them for the academic year is greatly appreciated. If it were not for your host family accepting to host you, you would not be able to spend a year in the USA and go to school. We expect that you will show your appreciation by thanking them and expressing it by treating them kindly and respectfully. Any gifts you have given them are surely kind offers and a way to thank your host family but words and actions go a long way with host families. Participate in the activities your host family does. Your host family may have interests and activities that are different from your own but to form part of a family it is expected that you will spend the majority of your time with them. You are welcome to make suggestions to them about things you would like to do with them and hopefully if it is something within their means they will do everything possible to try to do it. You should be understanding and cooperative if they can’t however. I have read and understand this Probation Letter. Til informasjon var moren svært syk mens han var borte og det var derfor han stadig snakket med henne. Selvfølgelig var vertsfamilie og representanter informert om dette. I recently received reports that (brief description of the behavior). The purpose of this letter is to inform you are officially on probation with AYUSA for the remainder of the year and to clarify with you what we expect of you as an AYUSA student. Failure to make an effort to (refer to the rule violation) could result in your dismissal form the AYUSA program. You recently posted 2 exchange students on YouTube making discriminatory and inappropriate comments about each student on the video. You added personal information about the students which could be detrimental to their relationships at school and their personal well being. You say, «it is a joke, just a joke» about serious violations of rules and disrespect you have shown to others. You have violated Host Family rules and the personal privacy of others. Because this behavior is considered unacceptable, you will be placed under close supervision by your local AYUSA representative, Tracy Ellenz, who will look for an improvement in your behavior and actions. Probation is a step before dismissal, meaning that AYUSA is giving you a chance to demonstrate a successful program experience. As an AYUSA student, it is your responsibility to follow program rules and procedures. You were selected for this program because we believe that you have the maturity and capability to deal with the demands of a year in the United States. Your computer and cell phone use has been terminated indefinitely. You will take responsibility for your own actions and take the consequences. No more jokes, or what you consider jokes on anyone. Respect others’ privacy and listen to staff and host family when they tell you that you are being disrespectful to teachers and other. Change your disrespectful behavior to others upon the request. An addendum may follow after investigation into the YouTube videos by authorities. AYUSA expects that you will take this probation notice very seriously and will make strides toward changing your attitude and behavior and completing a successful year in the U.S. We anticipate that you will act, for the remainder of your stay, in a manner befitting an AYUSA student and a junior ambassador of XXXX. After reading this letter, please sign the copy enclosed and mail it back to me at the following address by October 20th, 2008. You have told others that you have lost 22 pounds in the USA. You have told others that you were made to go to church. You have demanded the food of your native country, not eating the food of your host family. In the meantime, you have ordered delivery pizza and chocolate dunkers on at least 10 occasions after the host family’s meal. You act distant to relatives and friends of the host family when visiting, even though you were explained this and your host mom has a code word for you. You said you do not think you are disrespectful. You have refused to wash your clothes and wear clean clothing. You spend hours on your Playstation, then ask for help with your homework late at night. You are talking to your natural mom frequently on your international cell phone and reporting to staff that she has contradicting reports about your issues. Consequently, the purpose of this letter is to inform you that you are officially on warning with AYUSA and to clarify with you what we expect of you as an AYUSA student. Failure to make an effort to change your behavior/attitude will result in being placed on probation with the AYUSA program. You will give accurate accounts to others. You will read the in your student booklet pages 2-25. You will report to your representative, Tracy Ellenz as to what you have read. You will discontinue ordering from pizza delivery and try to adjust to American food and the special cooking of your host family. Your host mom has a code word for you when you are acting disrespectful, she will use it and you will stop your behavior. You will act respectful to teachers and others. You will wash your clothes and wear clean clothing at all times. You will limit your time on Playstation until all your homework is finished, the time limits will be set as needed by your host mom. Limit calls from home to once every two weeks. Your local AYUSA representative, Tracy Ellenz, is here to support you and will closely supervise you over the next 4 weeks. She will observe your attitude and effort weekly in making the suggested changes listed above. On October 2, 2008 Tracy will talk with you to check on your progress. If, at this time, reports indicate that you have not made any changes or your behavior has worsened, you will be placed on probation. 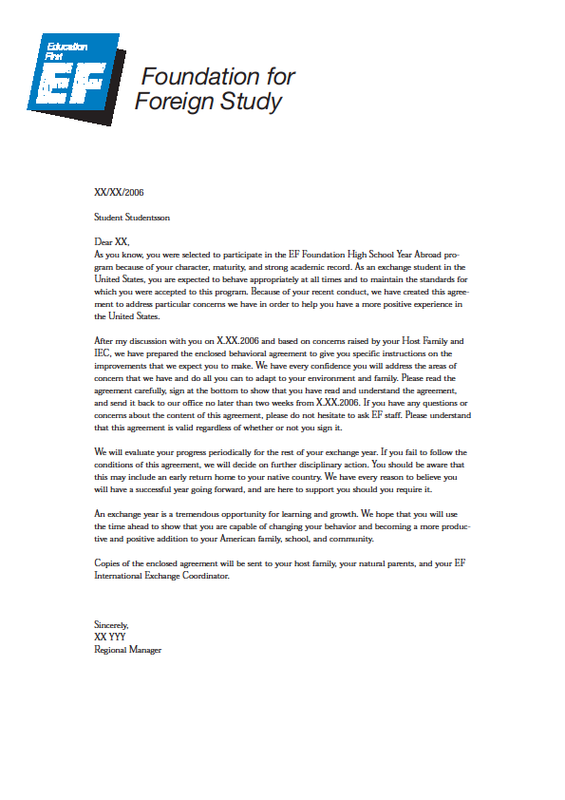 XXXX you were selected for this program because we believe that you have the maturity and capability to deal with the demands of a year in the United States. AYUSA expects that you will take this warning letter very seriously and will make strides toward changing your attitude and behavior and completing a successful year in the U.S. We anticipate that you will act, for the remainder of your stay, in a manner befitting an AYUSA student and a junior ambassador of XXXX. After reading this letter, please sign the copy enclosed and mail it back to Mary Lou Dunekacke at the following address by September 14th, 2008. I have read and understand this Warning Letter. I 2010 måtte en av mange elever skrive under på en slik avtale. Disse avtalene benytter man seg fortsatt av. Artikkelen til TV Hjelper deg gir detaljene i saken. Jeg tror ikke at tittelen «Holder elevene som gisler» er å ta for hardt i. Når jeg leser selve «Voluntary» avtalen minnes jeg på konseptet om løsepenger – «gi oss det vi vil ha ellers». Men der skal dere ta det helt med ro folkens. Dere trenger overhodet IKKE skrive under på en slik «avtale». 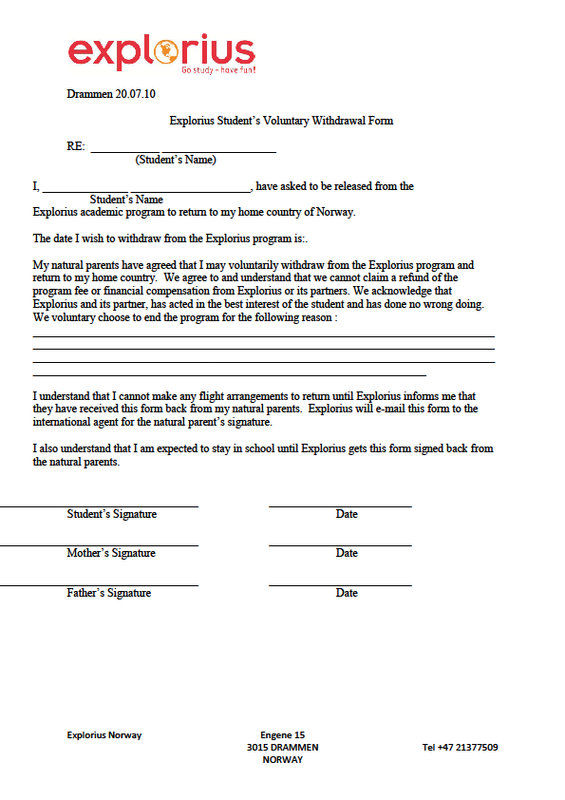 Det er ikke noe utvekslingsfirmaet kan gjøre mot dere. Om de prøver, anmeld dem og pass på at SIU blir informert om saken. 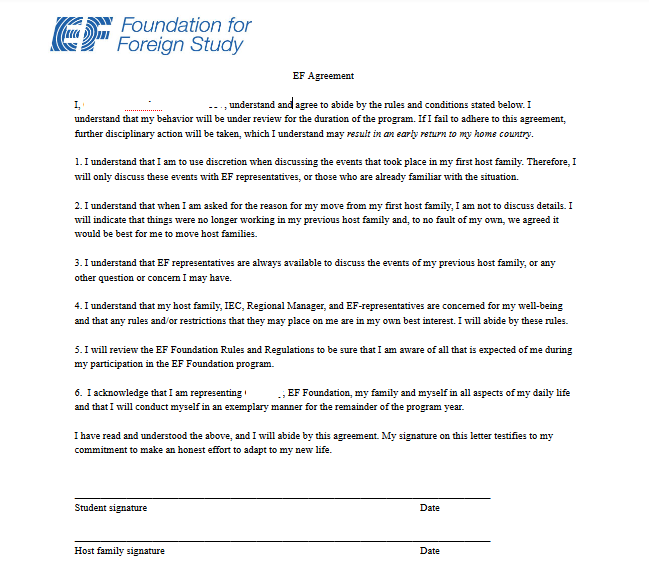 Dette er et av mange eksempler på en Behavioral Agreement / Agreement fra EF Education First / EF High School Year / EF Foundation for Foreign Study. Dersom man ikke skriver under er det en reell risiko for å bli sendt hjem. Vi anbefaler likevel at elever og foreldre lar være å skrive under på slike «agreements» etter at dere har undertegnet opprinnelig kontrakt. Om noen har lyst på historien som ligger bak akkurat denne avtalen kan dere ta kontakt med Danielle Grijalva hos CSFES.org. Her er en versjon av en oppførselskontrakt fra EF. Dette gjelder en elev som dro til USA 2006. Eleven har tydeligvis blitt flyttet til et nytt hjem. EF påstår at avtalen gjelder selv om eleven ikke skriver under. Interessant juridisk punkt kan man jo si.